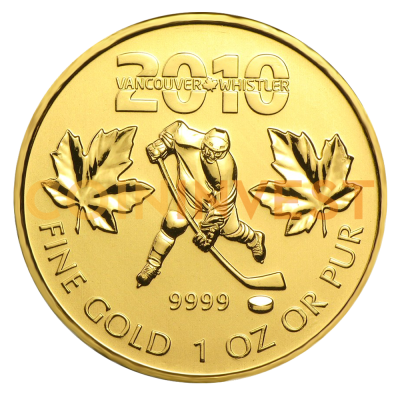 These special gold maple leaves were specifically created by the Royal Canadian Mint in honor of the Winter Olympics that was held in Vancouver in 2010. The Canadian Gold Maple Leaf is the official bullion coin of Canada.The reverse of the coin features a hockey player which is so representative of Canada. The observe of the coin features the Olympic games logo alongside a portrait of Queen Elizabeth II.